I'm super excited! This is my first summer, and I have sooooo many plans: long walkie-walks, chasing leaves and ballies, my pug-size pool that Mommy bought me. But Mommy and Daddy said the heat and summer can be bad for me. Daddy calls me a smooshed nose and told me that I can't be in the heat too long because I'll overheat and get sick. I'm not scared, 'cause I know that Mommy and Daddy will keep me safe and cool. But, I still like to play, especially with by best bud Spencer at our park. It's soaked in cool water and I then get to wear it. It's supposed to keep me a little bit cooler when I'm outside. Mommy and Daddy told me, though, that it isn't a substitute for safe summer play, especially for us pugs. So I still have to take breaks and maybe use my pool! If it helps, I'm all for it. I'll get used to it and try my best not to chew it like a delicious towel. Thanks for reading...Ut-oh, Mommy has the leash and Buddy belt...Gotta go...Spencer...Here I come....!! You look so darn cute! You could makes some extra treat monies and send in 'dat picture to the peeps who makes the Cool-it Bandana! You for sure represent dat in such an adorable ways!! My Mommy wants me to tell you to tell your Mommy (hee hees) loves the extra words....thanks for posting dats!! You look really cute in that cooling collar. Don't look so sad. You gave us alot of good advise. I have to learn to listen to my people.I never know when enough is enough. I get hot in the summer really fast. Danks for thinking of the cluck cluck chicken mans and sending him well wishes!! 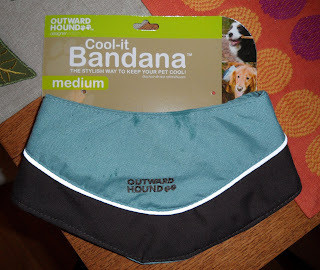 Thanks for that useful and interesting information about the Cool-It Bandana! I know my pug clients would HATE to wear the bandana but I know they will appreciate wearing it on hot days like it was in NH today! 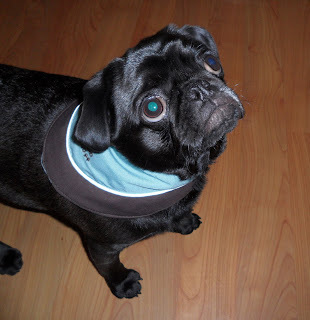 I've got to invest in a few of those bandanas and give them away to my pug pals but I know that other dogs get really, really uncomfortable in the hot weather too (and humans suffer too) so I'm thinking I've got a lot of broadcasting to do right away! I am going to post your post (heehee) on Twitter & FB! Oh and mom is totally excited about the next movie. Something about midnight showing and me staying home with daddy. Shesh! Doesn't she know that I love popcorn? Wilma!! I don't listen to mom and dad either. I was playing with Spencer tonight and new little chi/pug mix came into play. I tried to keep up with all her running...and I was too overheated. Mom had to make me stop then cool me down. She even had to carry me back to the car. She let me sit up front and put the A/C on so I could cool down. Mom said if I don't learn how to stop playing, that she'll make me stop! Shesh! Oh that is such a cool bandana. The colour matches you wonderfully. I thinks you will really get to likes it. I have 3 and I luvs mine. Mine don't looks as nice as yours though. Hiya Teacher's Pet! 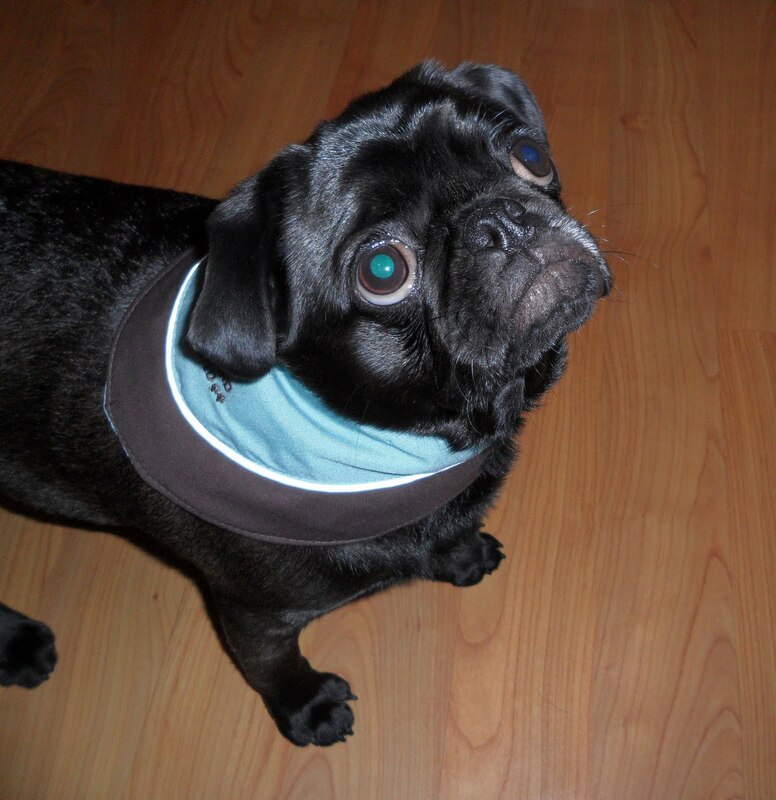 Thanks for helping to spread the word about how important it is for us pugs to stay cool. I'm glad I live close to San Francisco, so if it ever gets toooo hot, mom will just drive me into the city. Something about fog being natures air conditioning. Mom also bought a small spray bottle that mists water, so when I really get too hot, I can be misted down. Mom says she may use that on herself. Silly mom! I'm with Winston - you're totally rocking that bandana. You should definitely come over our side of the bridge next time you need to cool down. We could all go to the beach and get superpuggy!! Hi Bellatrix! You look super cute in that bandana but I worry that it will make you hot instead of keeping you cool. My advice to you is to head for the air conditioned house when it gets hot out. Nothing beats a cold house on a hot day. BellaTrix!!! I had so much fun with you at our play date this evening. I wish we had your cool new bandana when you got a to running really fast and got overheated tonight! I am so excited to wear mine- we are such a cute couple!! You look so cute in your new bandanna!! That is a very good idea. The momma has been looking at cool coats ever since she was a puggy on facebook with one. She thinks I should have one for 4th of July at grandma's so I don't get to hot! !